The actor Arashi Kichisaburô I held this name from the 1st lunar month of 1758 to the 12th lunar month of 1780. The actor Arashi Kitsusaburô I held the name of Arashi Kichisaburô II from the 1st lunar month of 1784  to the 12th lunar month of 1820. Arashi Kichisaburô II performing the role of Fukuoka Mitsugi in the drama "Ise Ondo Koi no Netaba"
The actor Arashi Kichisaburô III held this name from the 1st lunar month of 1821 to the 9th lunar month of 1864. Date of birth unknown. Elder son of Arashi Kichisaburô III, his first stage name was Arashi Rinshi II. 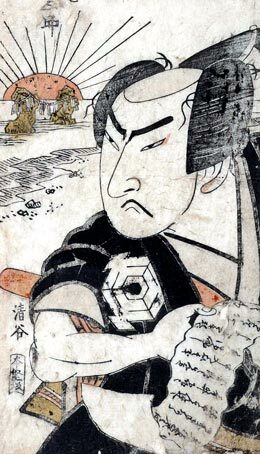 He went to Edo in Summer 1867 to take in August the name of Arashi Kichisaburô at the Nakamuraza. He unfortunately died there in September before the end of his shûmei. Therefore, he was never acknowledged as a regular holder of the name of Arashi Kichisaburô. Date of birth unkown. Related to Arashi Kichisaburô III, his first stage name in Ôsaka was Arashi Rinshô. 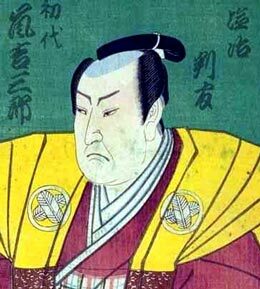 In the 8th lunar month of 1867, Arashi Kichisaburô III's eldest son Arashi Rinshi II was allowed to take the name of Arashi Kichisaburô in Edo at the Nakamuraza. He unfortunately died on stage during his shûmei in the 9th lunar month of 1867. 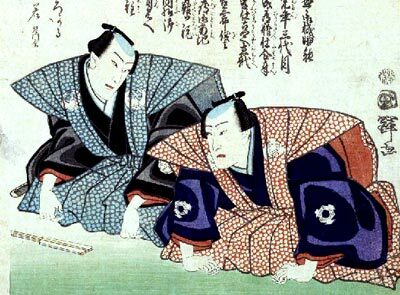 Rinshô was summoned to Edo, where he had to replace on the spot the late heir of Arashi Kichisaburô III to take the name of Arashi Kichisaburô IV, in the 10th lunar month of 1867 at the Nakamuraza, performing in the drama "Chiyo Banzei Araki no Shimadai". He went back to Kamigata in the 3rd lunar month of 1870, where he stayed up to his death the 15th of July 1879. Born in 1845. 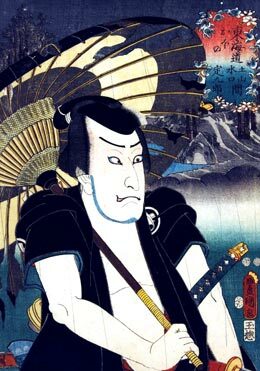 He started his career as a disciple of Nakamura Jakuemon I, then Nakamura Shibajaku II, and his first stage name was Nakamura Tasaburô. He took the name of Nakamura Shibazô III in 1874. He decided to perform under his real name, Matsuda Tasaburô, from February 1882 to September 1884. With the patronage of the star Nakamura Sôjûrô, he was allowed to take the name of Arashi Kichisaburô V in October 1884. He appeared on stage for the last time in November 1897 at the Minamiza, where he played the roles of Kyôgoku no Takumi and Mimyô in the dramas "Keya-mura" and "Moritsuna Jin'ya". He died the 9th of October 1898. The actor Arashi Kichisaburô VI held this name from June 1902 to October 1927. The actor Arashi Kichisaburô VII held this name from February 1928 to February 1973. Born in Kyôto the 6th of January 1932. Son of Arashi Kichisaburô VII, he made his first stage appearance in October 1940 at the Ôsaka Kabukiza, where he received the name of Arashi Rishô IV. 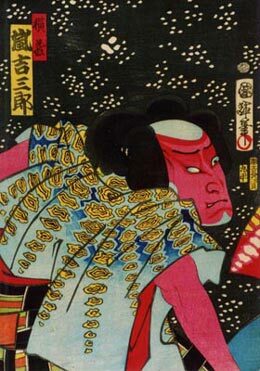 He had the chance to learn the art of Kabuki with talented teachers like Bandô Minosuke VI or Kataoka Gatô IV. He left the Kabuki world in 1946 and spent several years acting in movies. He worked also for the TV and took part to the Tôhô Kabuki projects. He was back in the Kabuki world several years after the death of his father (in 1973). He took the name of Arashi Kichisaburô VIII in March 1984 at the Nakaza, playing the role of Tenmaya Sôbê in the drama "Sonezaki Shinjû". He appeared on stage for the last time in January 1986, in Tôkyô at the Kabukiza, where he performed in the drama "Shuzenji Monogatari". He unfortunately died quickly, the 3rd of September 1987. 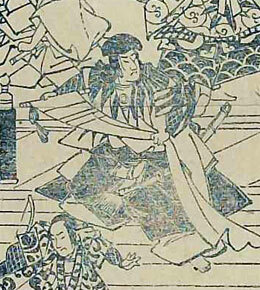 Not 1784 but 1787 in in Nojima Jusaburô's book "Kabuki Jinmei Jiten" or the Ritsumeikan University Actors Database.